With version 17.1, EGroupware has been extended from the classic groupware with an integrated CRM system to include a file server with Collabora Online Office. The browser-based EGroupware no longer needs to install an Office suite on the client. 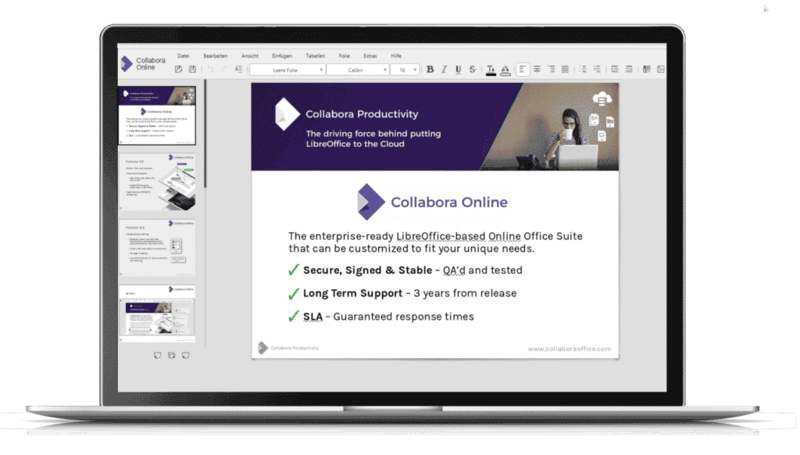 Users can share documents or folders with external partners and edit them directly with the integrated Collabora Online Office. All parties involved can edit text documents, spreadsheets or presentations together. Off special interest is the possibility to use stored information from the groupware or CRM system in Office documents. You can create a template with placeholders and save it in the integrated filemanager of EGroupware. Further information from EGroupware can then be merged into this template. In this way, users can, for example, check reports from timesheets online and release them for invoices. Contact data from the address book can be used to send a quotation as an attachment. Since version 17.1, EGroupware offers not only PGP but also S/Mime for end-to-end encryption of e-mails and task management. The keys are stored in the collaboration solution. The public key is located in the address book, allowing it to be used for all contacts; the private key is stored in the user’s mail profile, encrypted with the user’s login password. As announced, version 17.1 allows EGroupware to be adapted even further than before – for example, a login page that matches the company’s needs. The notifications are presented in a clearer way, so that important messages can be recognized more quickly. Users will find easier dialogs for selecting files or images in emails or when saving. In the address book, duplicates can be identified and merged via context menu. All contact data and the links (e. g. appointments, infolog entries, etc.) get automatically merged. The CRM function makes it possible to send personalized serial mails and to save them as infolog for documentation. CalDAV Sync removes tasks when the user has been freed from them. 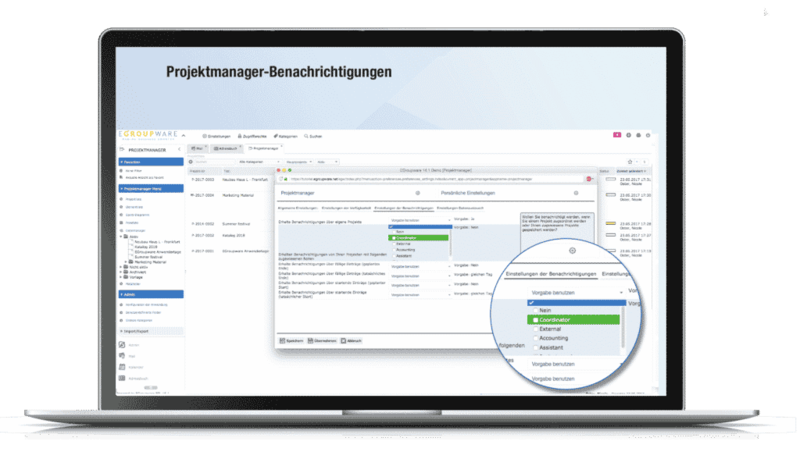 Some new features mainly affect administrators: In the project manager, notifications can be activated according to the roles of the users. For security reasons, the configuration allows you to set up protection against deletion for projects or restore deleted projects. Administrators get an overview page of the configured groups. And they have the ability to export all access rights as CSV with filters for users, groups and applications. Further information for version 17.1 and our migration offer can be found here. The administrators of your EGroupware will receive a short e-mail within the next few days regarding the date of the upgrade to the new version. We will carry out the technical update for you. Please note the changed minimum requirements of PHP 5.6+. We recommend PHP 7. This means you need Debian 8/9, Ubuntu 16.04, RHEL/Centos 6/7 or a corresponding current distribution of openSUSE or SLES with PHP 7. The repo of the Community Edition has already been automatically converted to EGroupware 17.1. From now on there are no new package updates for 16.1 CE. For customers of the full version of EPL, the conversion of the standard repos will not take place until the end of January 2018, and we will continue to provide package updates for EGroupware EPL 16.1. If you want to switch to the new EGroupware version 17.1 first, you have to change the repo manually. EGroupware packages for the 17.1 in the Univention Appcenter will be available soon. As an additional service for EPL customers, we offer a new VMware image with EGroupware 17.1, Collabora Office for our own server and Nginx as web server. Our EPL customers will shortly be informed separately by e-mail of the exact details of the repo changeover. As an alternative to a version 17.1 on its own server, EGroupware 17.1 is also available in the EGroupware data center. We will be happy to help you with any questions you may have regarding the migration to 17.1 or the migration to the EGroupware Cloud. EGroupware GmbH is happy to announce the first 17.1 release candidate. Please note the changed minimum requirement of PHP 5.6+, recommended PHP 7. It means you need at least a Debian 8/9, Ubuntu 16.04, RHEL/CentOS 6/7 or a current distribution of openSUSE or SLES with PHP 7. Above page also contains installation instructions for the installation via git with myrepos tool and archives. As an alternative to test an on-premises installation of version 17.1, EGroupware is available as a trial in the EGroupware data center.